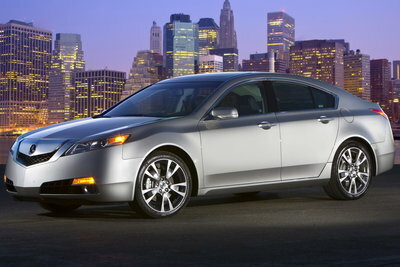 The TL is a premium mid-sized sedan loosely based on the popular Honda Accord. With prices starting at $35,000, the TL is a distinctively styled sedan with a high quality interior and a generous list of standard equipment. The front-wheel-drive TL base model is equipped with a powerful 280-bhp V6. For the performance enthusiast, the TL SH-AWD pairs a larger 305-bhp 3.7L V6 with Acura's all-wheel-drive system. The inclusion of all-wheel-drive widens the appeal to buyers who may be shopping rear-wheel-drive alternatives. An optional Technology package includes a voice activated navigation system, premium audio system and keyless operation. The short option list compares favorably to competitive offerings like the Cadillac CTS and Lexus ES whose base price quickly escalates with options. The redesigned fourth generation TL is larger and more powerful. Dramatic new styling wraps a body that is longer (6.2 inches) and wider (1.8 inches). Horsepower increases on the 3.5L V6-powered TL base model to 280-bhp. A new TL SH-AWD model featuring Acura's performance oriented all-wheel-drive system replaces the TL Type-S. A larger 3.7L V6 in the TL SH-AWD produces 305-bhp. A five-speed automatic transmission with paddle shifters is standard on both models.